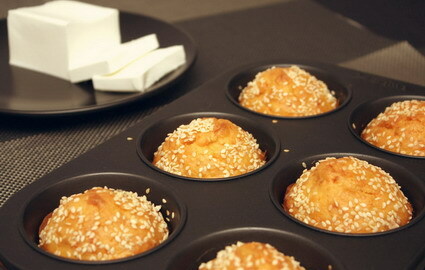 Treat yourself and your loved ones with delicious, soft and light savory muffins. Muffins with cheese are welcome in everyone's plate and are ideal for quick and irresistible breakfast or entertainment at home. ~ Toast 4-5 tablespoons sesame seeds over low heat and leave it aside. ~ In a bowl place the eggs and beat with a mixer. Gradually add the remaining ingredients in the following order: yogurt, butter, flour, baking powder, salt. Good mix. ~ Said amount of cheese grate it on the big side of the planer in a previously prepared mixture. ~ Fill the forms for muffins with the mixture and cover with sesame. ~ Bake at 200 ° C for half an hour. Looks good. I will try it.